The 8 Limbs 20th Anniversary Party took place on Saturday, October 15, the night of Big Storm 2016! We were grateful that the storm spared us, and a lovely group of revelers came up to 8 Limbs Capitol Hill for a night of community and celebration. Big thanks to Sam Fisher for being party planner extraordinaire. To Natasha Lady Krishna for creating Lady Krishna’s Peppermint Lounge in the Chandra studio and Darek Mazzone for the spinning tunes. 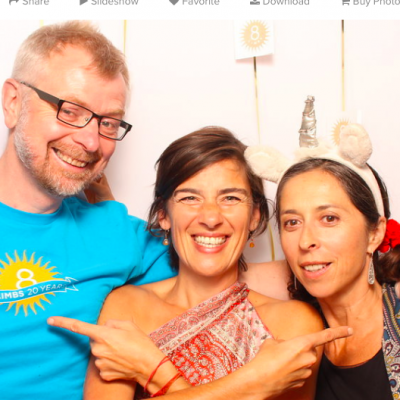 Thanks to Farestart and Cupcake Royale for food and cupcakes, to Chateau St. Michelle for wine, Digiphotobooth for, well, the photobooth, Roniq Bartanen for photography, and Graeme Aegerter for video documenting. Please visit Facebook for shots taken by our staff, Roniq Bartanen’s website for some lovely professional photos, and the Digiphotobooth website for our event shots (enter your email to view the shots). Our MC for the evening Alice Pedersen has been a student at 8 Limbs for more than ten years. She also worked behind the desk and was a nanny for Anne Phyfe’s daughter for several summers. Here are Alice’s words of introduction of Douglas Ridings, longtime 8 Limbs teacher and Odissi dancer. “Douglas began practicing at 8 Limbs soon after it opened in 1996. He was a regular in both Melina and Anne Phyfe’s classes in those early years. One day in the spring of 1999, he was walking down Pike Street and ran into both of them. He expressed his lack of enthusiasm for the career in Opera he had just finished training for and they encouraged him to consider a becoming a Yoga teacher. Douglas thought to himself “that’s a job where I can be barefoot” and never looked back. Endowed with hue of molten gold, has her forehead decorated with kumkuma powder, eyes as beautiful as the blue lotus, and she is as brave as a rock. She is invigorated with life, when amidst a group of musicians. Such is the beauty of Ragini Arabhi. Douglas has chosen this particular dance and Raaga because the spirit of energetic boldness tempered with compassion that it expresses reminds him of Anne Phyfe and Melina, not only when they founded this studio 20 years ago but also today as they refine that spirit with the wisdom of experience. He dedicates this dance to them and would like to thank them for their suggestion on the sidewalk below 17 years ago. 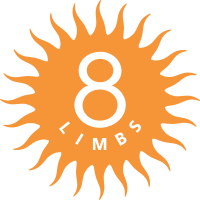 “I’m here to share my thoughts with you about why I believe 8 Limbs is successful. I believe 8 Limbs is so successful because of our teachers. At this time I would like to invite everyone who has taught on the 8 Limbs schedule up here beside me. Let’s also take a moment to bring into the room all the teachers that aren’t here tonight. Sauca – Thank you for the ways you care for the space, for the hundred times you’ve sweep or made the space tidy for your students. Thank you for the inner cleaning you do in the privacy of your own home. —-made the space looking nice for the next group coming in. Tapas – for the discipline you have to practice and all the ways you stay passionate about yoga and teaching year after – often without taking sabbaticals or breaks like a more traditional school teacher. Svadhyaya – I salute you for all the personal work you do on yourself with your teachers, therapist, psychics, coaches, astrologers to see and understand yourself more clearly. Isvarapranidha – We appreciate the humility you demonstrate in offering the fruits of your practice and teaching to the divine, nature, whatever. I thank you for being part of 8 Limbs – the one in me acknowledges the light in you. Next…is Community ~ Community, without you and without your continued support we would not be here. Thank you for returning to us and for each friend that you’ve brought to 8 Limbs over the years. Many of you are like family to use now and we hope to continue to grow together in the years to come. For Anne Phyfe’s speech, click here!